The herbicide glyphosate has been the subject of some major lawsuits over the past few years. Weed Killer Crisis, a website dedicated to documenting the "unfolding legal and health crisis" surrounding pesticides and herbicides, recently compiled government data on glyphosate and other agricultural chemicals around the country into easy-to-read visuals, to inform the public on pesticide use in their states. It's pretty interesting to see the statistics, which reveal the states with the highest (and lowest) concentrations of possibly carcinogenic glyphosate. 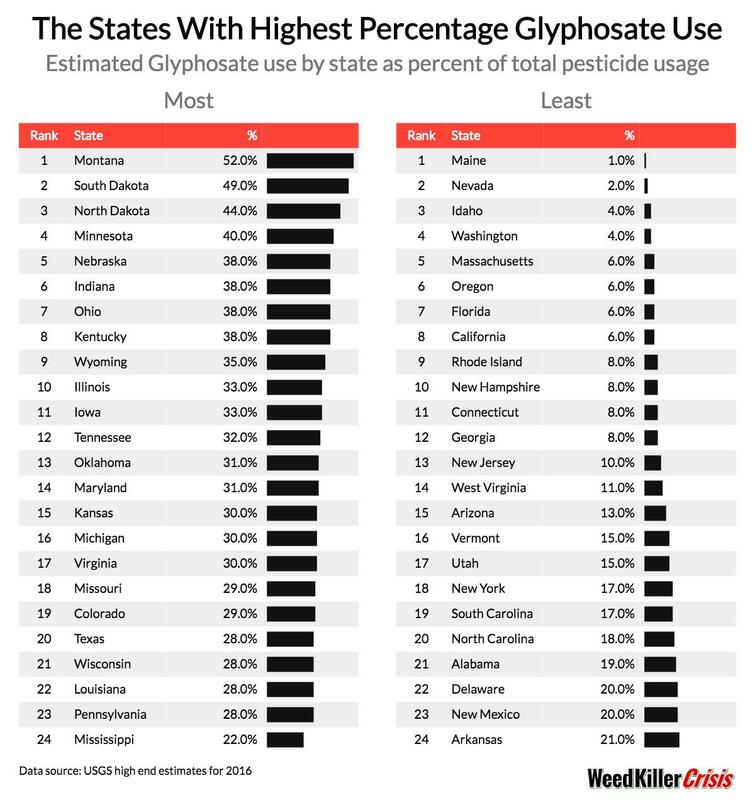 And while seeing your state towards the top of the list may make you feel a bit hopeless, there are luckily plenty of ways to combat the use of glyphosate in your state. For the visuals, Weed Killer Crisis got its data from the U.S. Geological Survey's (USGS) 2016 Estimated Annual Agricultural Pesticide Use report. The visuals measure (in kilograms) which states use the most glyphosate across the nation, and found that Illinois came out on top, using more than 11 million kilograms a year. The midwestern state is followed by Iowa, Nebraska, Kansas, and North Dakota. The state with the least glyphosate use by kilogram is Rhode Island, followed by New Hampshire, Massachusetts, Maine, and Connecticut. The report also includes charts detailing which states use the most and least pesticides overall (California, where most U.S. produce is grown, unsurprisingly clenched the No. 1 spot); and which states have the highest percentage of glyphosate use among their total pesticide use (Montana). So even though Illinois may use the most glyphosate by kilogram, the pesticide only makes up 33 percent of its total pesticide use. Two lawsuits regarding glyphosate have made national news in recent years. In March 2019, a three-year lawsuit finally resulted in the corporation Monsanto being ordered to pay $80 million in damages to Edwin Hardeman, as CNN reported. A jury ruled that Roundup, Monsanto's popular commercial version of glyphosate, was a cause of Hardeman's non-Hodgkin's lymphoma. Roundup does not come with a warning that it is a possible carcinogen (meaning a cancer-causing substance), even though organizations including the World Health Organization (WHO) have found it to be one. And last year, a jury found Monsanto guilty in a similar case, and the corporation was ordered to pay $78 million in damages to Dewayne Johnson, TIME reported. The former school groundskeeper was drenched with Roundup due to a faulty sprayer while at work, and soon after, he was diagnosed with terminal non-Hodgkin's lymphoma. At the moment, more than 11,000 citizens are currently in the process of suing Monsanto with similar cases, according to Fortune. 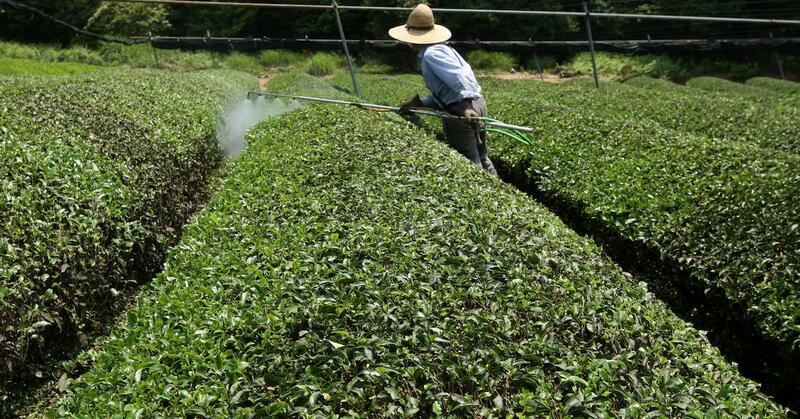 Luckily, use of the pesticide may be declining. Earlier this year, the city of Miami banned glyphosate from municipal use, according to the environmental organization Miami Waterkeeper. Additionally, in January, Costco announced it would stop selling Roundup and all other glyphosate products in its stores, as per Moms Across America. If the use of glyphosate or other pesticides is high in your state, don't hesitate to reach out to local leaders and ask them to ban glyphosate. Click here to look up contact information for your federal, state, and local elected officials. With cities and stores already having banned glyphosate, you shouldn't be surprised if your local leaders hear your concerns and propose their own legislation to ban the herbicide.